Japanese Middle age Edo period city office, court, police, government office. It is old building, but wheelchair can enter inside with Takayama city accessible tourism great effort. The workers put a ramp at entrance and allow us to enter on wheelchair. Many small wooden ramp in the building. Enjoy morning market in front of Jinya too. An open-air museum. There are old houses there. The streets are hilly, but wheelchair users can go around the museum. The local buses are not lower floor. But some wheelchair accessible mini buses (Sarubobo Bus) also run in this area. 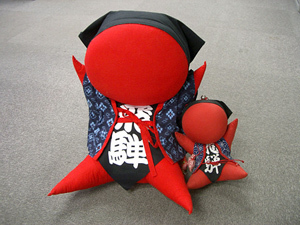 We can feel the traditional culture and life style. An old village in deep mountains. UNESCO World Heritage Site. There are Traditional Japanese mountain houses. Many steps in those old houses. But in the folk museum, wheelchair users can enter some houses. We can also enjoy seeing houses from the outside. Buses or hired taxis are only public transportation. Public wheelchair accessible toilets are available in the tourist area. 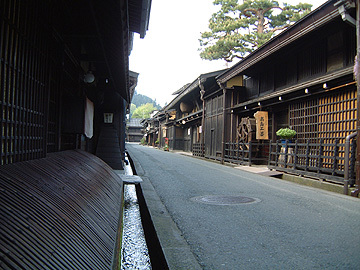 Another Japanese old village, which is a UNESCO World Heritage Site just like Shirakawa village. Goklayama is smaller than Shirakawa, and not so many tourists come. However, the village is very quiet and calm. Some areas are hilly, but wheelchair users can walk on the main road. Driving a car is the only option to enter Gokayama area. The East of Takayama is a high mountain area. Many famous mountains. Shin-Hodaka ropeways are wheelchair friendly. There are ramps, lifts, and chair lifts. 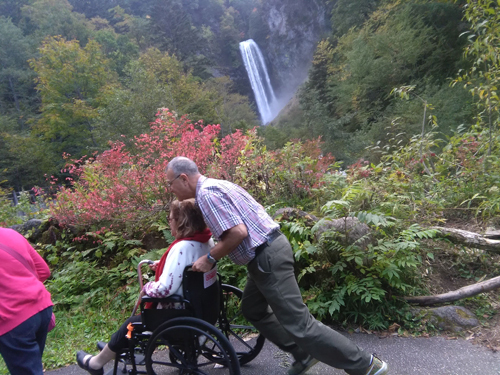 So wheelchair users can visit snowy mountains by the ropeway. The viewing platform is also wheelchair accessible. There is a hot spring in the area. A big waterfall between Matsumoto and Takayama. The trail is wheelchair accessible, but so hilly. Wheelchair users need big push. Small town in mountain located on the way between Nagoya and Takayama. 90 min drive to south from Takayama. The castle is not wheelchair accessible, but it is possible to access nearby. Quiet small old town. Famous for local industry making plastic food models.